Siamese cats are a wonderful breed of cat and are one of the most popular pedigree cats in the UK. There are a number of legends surrounding Siamese cats and their origins but it is safe to say that they originated in Siam (Thailand). They were exported to the UK in the 1890’s where selective breeding began by the early UK cat breeders. Much has changed since the 1890’s including the appearance of the Siamese cat! The moderate style Siamese has evolved into a long, lithe cat with very large ears and a long tail. You could say their type is now far more exaggerated. There are now also many more Siamese cat colours recognised than there were originally. However as we know they are basically the same style of cat. They still display the same pointed coats and blue eyes along with their fantastic intelligence. Many of us just enjoy our Siamese cats as companions but some people also enjoy showing their cats. Competition at cat shows can be very fierce! The ‘Modern Style Siamese Cats’ seem to dominate the show circuit these days. You rarely see an ‘Old Style Siamese’ at shows anymore. Most Siamese cat breeders also show their cats. This is the reason that most of the pet Siamese kittens available are now the more modern style. If you asked most people to describe a Siamese cat then they would probably describe them as a blue eyed cat with a cream body and a black face, tail and legs. Most people are probably thinking of the seal point Siamese or perhaps the chocolate point when they try to picture a Siamese cat. 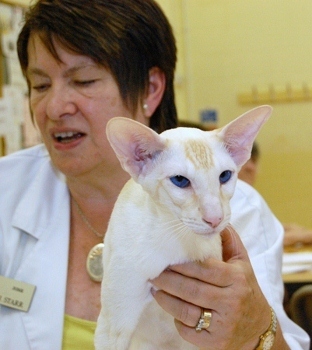 The other two most common colours are probably the blue point Siamese and the lilac point. Most Siamese cat lovers will also be familiar with these two colours. There are also some less well known colours of Siamese cat which are bred and shown at cat shows in UK. These colours are cinnamon point, fawn point and caramel point. In addition to these Siamese colours there are also the red series Siamese. The red series Siamese cats are the red point, apricot point and cream point which can be male or female. There are also tortie point Siamese which are always female except on very rare occasions. Due to a genetic anomaly sometimes a tortie male is born but they are nearly always sterile. The tortie point Siamese come in all the colours mentioned above except for red point, apricot point and cream point. In addition to all the various colours listed above the Siamese cat also has a tabby and a tortie tabby version. Again both these varieties come in all the colours listed above. Finally we have Balinese cats which are the long haired cousins of the Siamese. Balinese cats are basically Siamese cats but with a longer silky coat and a beautiful plumed tail. Balinese cats come in the same variety of colours as the Siamese with the exception of Cinnamon and Fawn. From time to time we will publish articles of interest about Siamese cats. A lot of these articles are equally relevant to cat owners and cat breeders. Some of the subjects covered will be about cat food and nutrition, grooming and taking care of your cat and general topics on cat ownership. We will also touch on showing your cat at a cat show and breeding from your cat. These subjects cross over with the topics listed below. Some of the cat articles are catered towards cat breeders. They will include subjects such as feline genetics, cat reproduction and various topics that we hope will be useful to Siamese cat breeders. We will also cover advertising kittens, keeping a stud cat, making pedigrees etc. We are also happy to consider your suggestions for articles on any cat related topic. 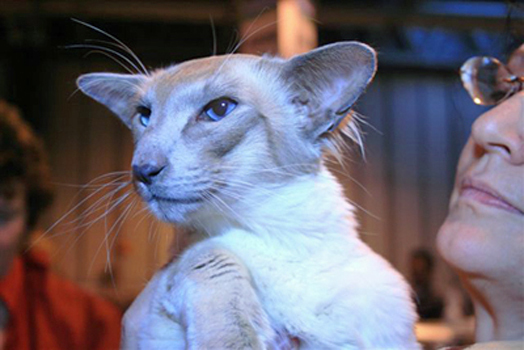 If you have a question about Siamese cats or indeed cats in general then please contact the Siamese Cat Breeder team. We will be happy to write an article just for you!